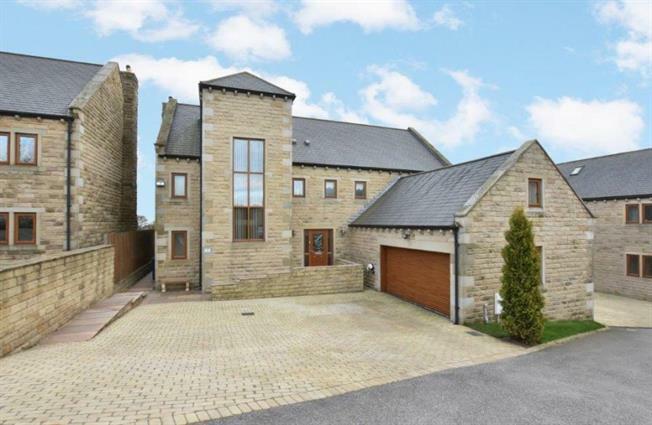 6 Bedroom Detached House For Sale in Sheffield for Fixed Price £560,000. For sale is this amazing and beautifully presented six bedroom detached property in the lovely village of Thurgoland. This large property hosts six bedrooms, two family sized bathrooms, the master bedroom has a bigger than average en suite and walk in wardrobe, a fantastic kitchen with a raised dining area perfect for socialising, extra large lounge, utility room, downstairs toilet, double garage with electric doors and a triple driveway. The property also benefits from under floor heating, a heat recovery ventilation system, electric car charger socket and good sized garden, natural light and beautiful neutral decor throughout. Like the current owners any family who purchase this property will thoroughly enjoy living here and making this house into a true home which is beautiful and welcoming. Positioned with great links to the M1 motorway allowing easy access to Meadowhall shopping centre which is less than 20 minutes drive away and the brand new Fox Valley shopping district in Stocksbridge with a host of fashionable shops and restaurants. Our words simply cannot give this property the appreciation it truly deserves this is why a viewing is highly recommended to really take in all this home has to offer. Ground Floor - Beautiful and inviting hallway which consists of the grand staircase to all floor and doors to all ground floor rooms. Ground Floor - Larger than average lounge with fire place and double doors leading out into the garden area. Ground Floor - Amazing kitchen with plenty of cupboard space and spaces for kitchen appliances, integrated dishwasher and breakfast bar island. Double doors leading to garden and access to utility room. Ground Floor - Perfect for socialising and family dinners, raised slightly above the kitchen. Ground Floor - Great space for utilities such as washing machine, includes integrated dryer, also access into garage. Ground Floor - Big enough for two cars and plenty of room left over for storage, electric garage door, concrete floor. First Floor - Large master bedroom with walk in wardrobes and en suite, over looks the garden and rear playing fields. First Floor - Beautiful en suite with his and hers sinks, built in shower and w/c. Electric underfloor heating. Thermostatically controlled shower mixer. First Floor - Larger than average double bedroom, plenty of space for wardrobes and drawers, over looks garden and rear playing fields. First Floor - Good sized double, looks out to the front of the house. First Floor - Great master/ family bathroom with his and hers sinks, stand alone shower, separate bath and w/c. First Floor - Large room currently used as a study, nice and long. Velux windows, room is above the garage and is a loft style room. Second Floor - The biggest room in the house is perfect for socialising or could be turned into a little apartment within the house, velux widows plenty of storage in the eaves and in a loft style. Second Floor - Again great size, consists of bath, sink and w/c. Large, lawned and low maintenance garden to the rear of the property which includes a summer house. Backs on the playing fields. All measurements are approximate. None of the services, fittings or appliances (if any), heating installations, plumbing or electrical systems have been tested and no warranty is given as to their working ability.